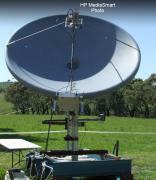 6 images found for "VK3NX" in "Stations equipment"
New 24 GHz antenna (Andrew). There is transverter 24048/1296 MHz Thales 26 GHz. Antenna box with waveguide switch and two LNAs. Antenna box is connected with 10W SSPA (DB6NT) via flexi waveguide WR42. Complete antenna box with super VE4MA feeder. All mounted in focal point of 2.4 m dish.